If you are planning a visit to Monet’s garden in Giverny, you may wonder what is the best time of year to come. There are many! The scenery, the flower show change with the seasons. One of my favorite time is the tulip’s. Tulips flower mostly during the second half of April. Their blooming is spectacular, gorgeous, breathtaking. They offer colors, colors, colors, always bright ones, they can have soft and tender or very warm flaming tones. They exist in an infinite variety of forms and aspects. And they provide amazing mass effects. This border, for instance, was designed by Monet after visiting and painting the tulip fields in Holland. He was impressed by the large colorful stripes of these cultures. When he came back to Giverny, Monet decided he wanted a very long border in his garden, from top to bottom, planted according to a monochromatic scheme. This oversized flower bed records to his visual experience in Holland, as far as color and size are concerned. But Monet could not be satisfied with one sort of tulips only. 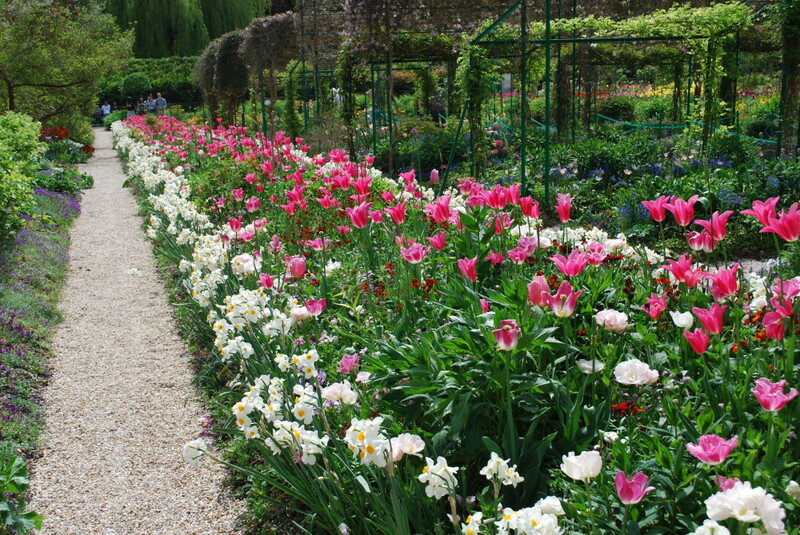 His ‘tulip field’ is a very refined mixed border composed of many different sorts of tulips. They harmonize, their pink is slightly different, producing the subtle variation of tones that one can observe on an impressionist painting. A beautiful example of the way Monet used flowers like brushstrokes.